The bath pasteurizer units are made for the pasteurization of your juice or cider in a water bath after is has been packaged into cans, bottles or pouches. 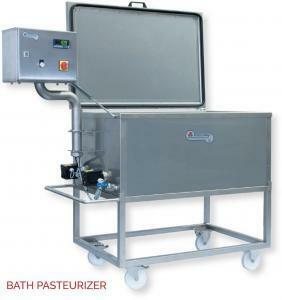 The contents of the bath pasteurizer are heated by two electric elements. The containers are placed into the bath and heated to the set temperature. Through the direct heating of the water basin, a high level of effectiveness is achieved. This, in conjunction with the temperature and time control, guarantees a constant processing temperature. These bath pasteurizers need 3 phase power to work efficiently. A gas heating unit is available upon request. The machines can be provided with either 9 kW or 18 kW heating elements. For transport the base unit is removable without any tools. The entire tank, including the lid, is made with a double wall insulation. Place the filled bottles in the pasteurizer, close the lid and press the start button. At the end of the process the machine shuts off automatically. The display permanently shows the actual process temperature.